"My heart is filled with so much gratitude. There were moments of doubt where I felt overwhelmed and I felt the pressure," said Gray, who wore a red and orange dress that was inspired by Mount Mayon, a volcano that erupted this year. After she was crowned, Gray told reporters the question was "definitely relevant" and "an active topic", in an apparent reference to the war on drugs in the Philippines that has killed thousands of Filipinos and caused international alarm. Gray is the fourth Filipina to win Miss Universe and the second in three years. The pageant was shown live on the country's biggest television network and dominated social media. Salvador Panelo, spokesman for President Rodrigo Duterte, said her win would put the country on the world map for its "beauty and elegance." 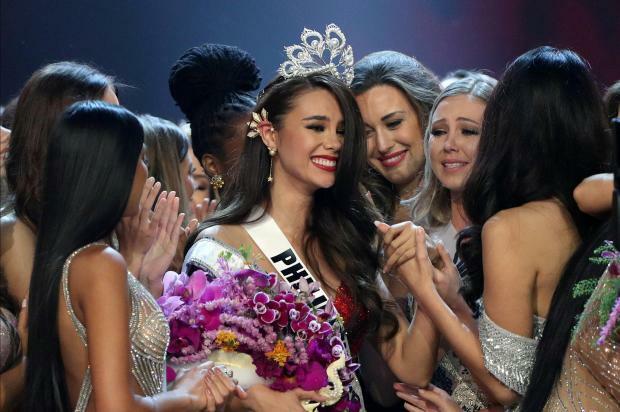 "In her success, Miss Philippines has shown to the world that women in our country have the ability to turn dreams into reality through passion, diligence, determination and hard work," he said.